Actress Joanna Lumley has received an award from a county with a special association with the Gurkhas for her work with their veterans. Ms Lumley, whose father was a Gurkha officer, fronted a successful campaign for UK settlement rights for the Gurkhas in 2009. Powys council presented her with the award and a certificate for "exemplary achievement" at a ceremony in London. The Gurkha Company (Mandalay) has been stationed in Brecon since 1974. Ms Lumley was presented with a Powys gold kite award and a "certificate of appreciation for exemplary achievement" by the chairman of Powys council, Garry Banks, at the Palace of Westminster. He was joined by Brecon and Radnorshire MP Roger Williams, and Roger Buckland MP, chairman of the All-Party Parliamentary Group on Gurkha Rights. The council said Ms Lumley's award was in "honour and recognition of her dedication and commitment to the Gurkha campaign". 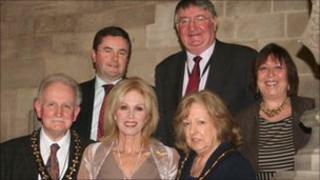 Ms Lumley said: "I feel very honoured to receive this award and will wear the gold kite brooch with pride." The Gurkha Company (Mandalay) is stationed at Dering Lines, Brecon, and the Gurkhas were made honorary citizens of the town in 1985.